Turkey sandwiches are a staple of the day-after Thanksgiving in most households. This version with gravy on toast from the Glen-Mor Restaurant’s menu is a great way to use multiple leftovers. Toast two pieces of bread in a toaster or on a grill. Place turkey meat on dry toast. 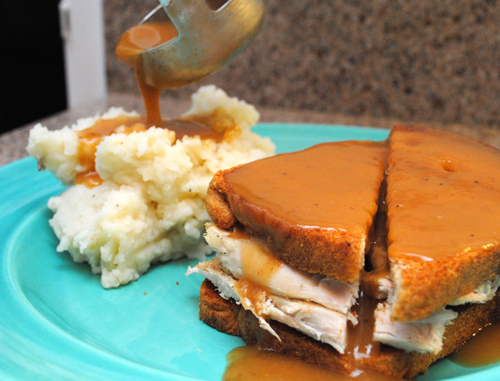 Remove top piece of bread and pour 1/4 cup of gravy over turkey. Return top piece of bread and slice sandwich. Pour remaining 1/4 cup gravy over top of sandwich and serve. The Glen-Mor Restaurant also served hot lamb sandwiches with gravy using leftovers from Roast Leg of Lamb and similar sandwiches from leftover Pot Roast.